Proofs 15 to 21 that the Earth is not flat. Proofs 15 to 22 that the Earth is not flat. What does the public believe its shape is? The Sun's shadow produced by a sundial rotates clockwise in the Northern Hemisphere, and counterclockwise in the Southern Hemisphere. That would be impossible with a flat earth, but is a necessary observation if the Earth is close to a sphere. Photographing star trails around Polaris in the Northern Hemisphere shows that the stars appear to draw circles in a counterclockwise direction in the Northern Hemisphere. A photograph in the Southern Hemisphere shows them apparently moving counterclockwise. Again, that would be impossible with a flat Earth, but is a necessary observation in a spherical Earth. As viewed from the Northern Hemisphere, the sun appears to rotates clockwise. In the Southern Hemisphere rotation is counterclockwise. This can be observed, with suitable precautions to avoid damage to one's eyes, by tracking sunspots across the surface of the Sun. Again this is impossible with a flat Earth, but is a necessary observation in a spherical Earth. The Arctic region lies north of the Arctic Circle, which is a line at 66Â°33' North Latitude. At that latitude, the sun remains completely below the horizon throughout the 24 hours at the date of the Winter Solstice, about DEC-21. As one moves closer to the North pole the number of days without sunlight increase. Also at the Arctic Circle, the sun remains completely above the horizon near the time of the Summer Solstice (about JUN-21). As one moves closer to the North pole the number of days with 24 hours of sunlight increase. The same is true near the South Pole, except that the dates are reversed. However, if the Earth were flat, then when the sun rose above the horizon, it would be visible everywhere on Earth. The number of hours of sunlight and darkness would be the same on every day and at every location around the Earth. Earth rise or set. View of the Earth. The "Ask an Astronomer" web site is updated by volunteers in the Astronomy Department of Cornell University. They attempt to give answers to questions posed by their site visitors. "... imagine for simplicity that the orbit of the Moon was exactly in the same plane as the Earth's equator. From the northern hemisphere, the Moon is in the southern sky because that's the direction of the Earth's equator. In the southern hemisphere the situation is reversed. If the Earth were flat, then everybody on earth would see the moon in the same orientation. 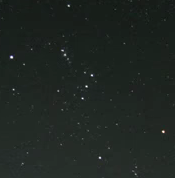 The constellation of Orion appears upside down in the Southern Hemisphere -- say in Australia or New Zealand -- compared to how it appears in the Northern Hemisphere -- say in North America or Europe. Orthodox flat-earth teachings include a belief that the sun and moon are both small objects, approximately the same size, and both located about the same distance from the earth. Both are believed to rotate around the flat earth. Samuel Birley Rowbotham (1816-1884), a believer in fundamentalist Christianity, was the first major promoter in a flat earth in modern times. He used several pseudonyms: Tryon, S. Goulden, Parallax, and Dr. Birley. 3 He was the first flat-earth believer to estimate the diameter of the sun and moon in a flat Earth system. He estimated both to be about 32 miles. Many flat earthers still use this value. They further believe that both are about 3,000 miles from Earth. Meanwhile, astronomers believe the distance between the Earth and moon is about 239,000 miles or 384,400 km. The two values differ by a factor of about 80. Fortunately, it is now possible to measure the distance to the moon from Earth by generating a radar pulse on Earth, bouncing the signal off of the moon, and measuring the elapsed time between the transmission of the signal and the detection of the return pulse. The Apollo 11 missions left reflectors on the surface of the moon to facilitate such measurements by enhancing the return signal's strength. Knowing the speed of radar signals, which is about 300 million meters per second, the distance can be accurately measured with the right equipment. This type of measurement was shown on Episode 23 on Season 3 of the TV program "The Big Bang Theory." 3 The episode is called "The Lunar Excitation." The team said that they used equipment borrowed from the California Institute of Technology (a.k.a. Caltech ) where most of the show's main characters are supposed to work. At a distance of 384,400 km, the signal would have taken 2.56 seconds to travel from the earth to moon and back. If the moon was only 3,000 miles away, the interval would have been about 32 milliseconds. Needless to say, astronomers measure intervals close to the 2.5 seconds estimated by Leonard on the program. During the TV episode, Leonard demolished another NASA conspiracy theory. He commented that this type of measurement is the only definitive technique to prove that humans actually did reach the moon and leave objects on its surface. This type of measurement only proves that one part of the Flat Earth belief system is incorrect and that the distance from the Earth to the moon is about 80 times that estimated by Flat Earthers. This proof does not prove that the Earth is roughly spherical in shape. "... caused by chemical reactions high in Earth's atmosphere. ... This ghostly glow usually happens when ultraviolet radiation from sunlight energizes molecules of nitrogen, oxygen, sodium and ozone in the atmosphere. These energized molecules then bump into each other and lose energy as they collide, resulting in a faint but spectacular afterglow." The dark, complex shapes in the bottom of the above photograph are parts of the ISS. This NASA photograph shows the ISS circling the Earth. It was taken from the space shuttle Endeavour on 2011-MAY-30. 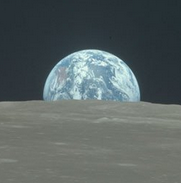 A superb 169 second NASA video is available on You Tube. 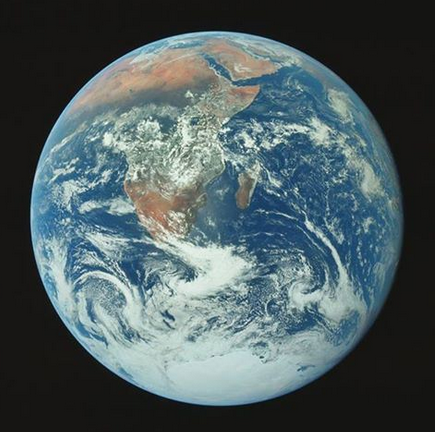 If an austronaught took 92 similar photographs at the rate of one a minute, the ISS would have made one complete orbit of the Earth, The first and 92nd photos could then be seen to show the same part of the Earth's surface. Examination of the other photographs would show the various continents. One would see one sunrise and sunset, and seen absolute proof that the Earth's shape approximates a sphere. But, skeptics would probably claim that the 92 photos were all photoshopped. Mike Hughes, 61, has built a' rocket called Liberty 1. He had planned to launch a rocket from public land in California. However, the Bureau of Land ManagementÂ prohibited the launch. He later arranged to take off from private land at Amboy, CA. His goal is to find out the actual shape of the Earth. However his plans do not seem to make a lot of sense. He only expected to reach an altitude of a few thousand feet. He could do the same by renting a private plane at far less cost. Also, at that altitude, the view of the horizon will be essentially the same as at ground level. To see the curvature of the Earth, he would need to go much higher. "Anonymous No. 16764" commented on the Goldwater.com web site that he had traveled to Russia where one can allegedly pay 15,000 Euros to go into the stratosphere in a Mig29. 6 Some suggest that he could buy a ticket on a conventional airliner; they typically cruise at 28 to 35 thousand feet altitude. 84% believe the Earth is spherical. 5% once believed in a spherical earth but now have doubts. 2% believe that the Earth is flat. 4% believe that the Earth is flat. This is the highest belief among any age group. 52% of those who believe in a flat Earth consider themselves to be "very religious." This compares with 20% for the general population. This difference may be caused by the references in the Bible to a flat Earth.